I have been on a campaign to reduce the number of times in a day when I resort to putting on a DVD because I need the kids to self-entertain. This usually happens during meal preparation time or when I am trying to get ready for homeschool lessons. I think (or at least I tell myself) that even a simple activity like doodling or play dough will benefit them in the long run. At least they are developing their fine motor skills, creativity, and other age-appropriate skills which will help in learning readiness, instead of sitting passively on the sofa, eyes glued to the goggle box! So... As simple as these activities might sound, I am going to share them anyway, with the firm belief that even a simple time of play is better than an iPad game. 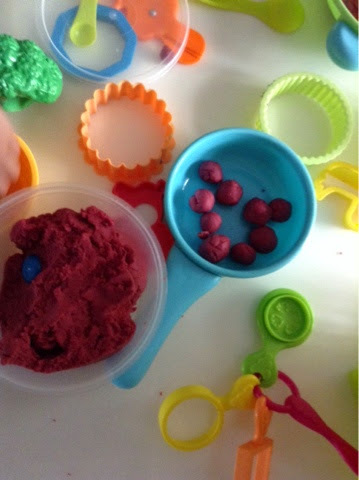 Developing fine motor skills by rolling fine play dough balls. 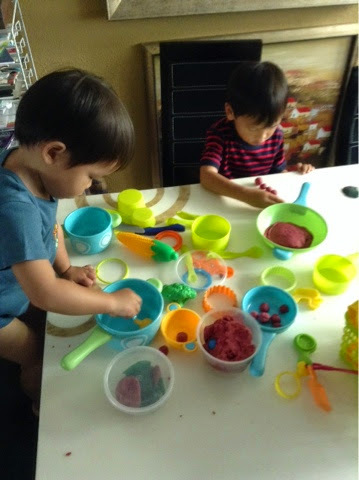 Start with some play dough. We make ours at home and it takes no more than 15 minutes. I like doing our own as I find the commercial brands tend to be sticky in our warm climate. Also, we can add our own food colourings and flavouring to the dough depending on the season. For this activity, we used a batch of Autumn-scented dough with cinnamon and nutmeg for a sensory experience! We use this no-cook recipe, which is so easy. A wide variety of "food" for the boys to cook. Dough is fantastic for developing fine motor skills. You can roll it into balls, pound it, squash it. 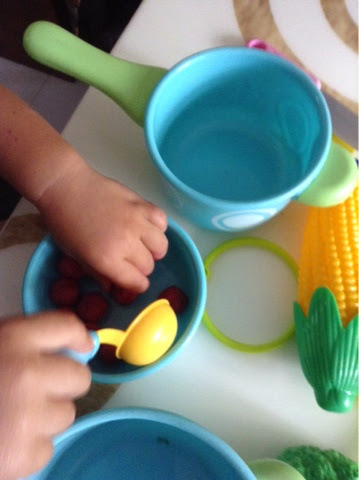 All that exercise helps to prepare little hands and fingers for writing and drawing! We practiced rolling it into balls, then I took out the Masak Masak set (the Malay word for cooking) and left it up to the kids' imagination. The kids cooked their dinner so that I could be free to cook ours! 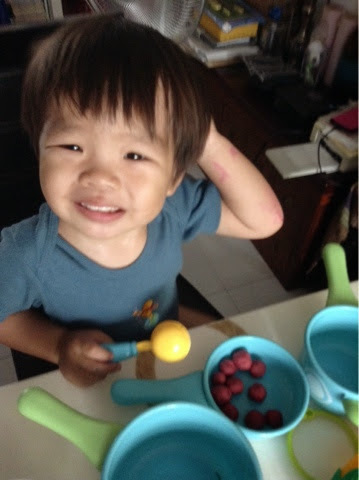 The 2yo was so proud of his "fish balls". - Bring out the materials and let the fun begin! Letting children explore and develop their creativity through pretend play.